The North America second location MENYA MUSASHI NITEN ICHIRYU Seattle is having a Grand Opening Special Event on Friday, November 9, 2018 in Capitol Hill, Seattle. Comes shortly after the first North America location opened in Los Angeles. 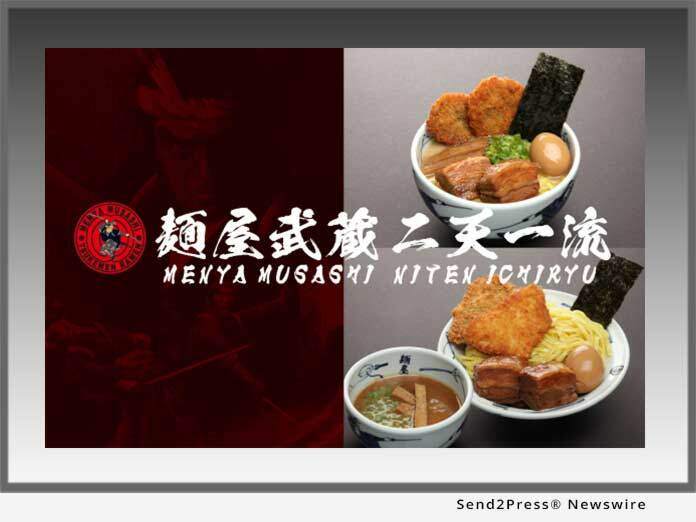 SEATTLE, Wash., Oct 23, 2018 (SEND2PRESS NEWSWIRE) -- The North America second location MENYA MUSASHI NITEN ICHIRYU Seattle is having a Grand Opening Special Event on Friday, November 9, 2018 in Capitol Hill, Seattle. Event Details: Ramen or Tsukemen (Dipping Ramen) is offered at a special price of $3/bowl on a first come first served basis. Regular Business Hours: MON-FRI 11:30 a.m. - 2:30 p.m., 5:30 p.m. - 10 p.m. / SAT 11:30 a.m. - 11 p.m. / SUN 11:30 a.m. - 10 p.m.
MENYA MUSASHI was founded by Takeshi Yamada in 1996. Similar to the world-renowned sword master Musashi Miyamoto who proclaimed "I practice many arts and abilities - all things with no teacher," founder Mr. Yamada self-taught himself the art of making Ramen and established this Ramen restaurant.